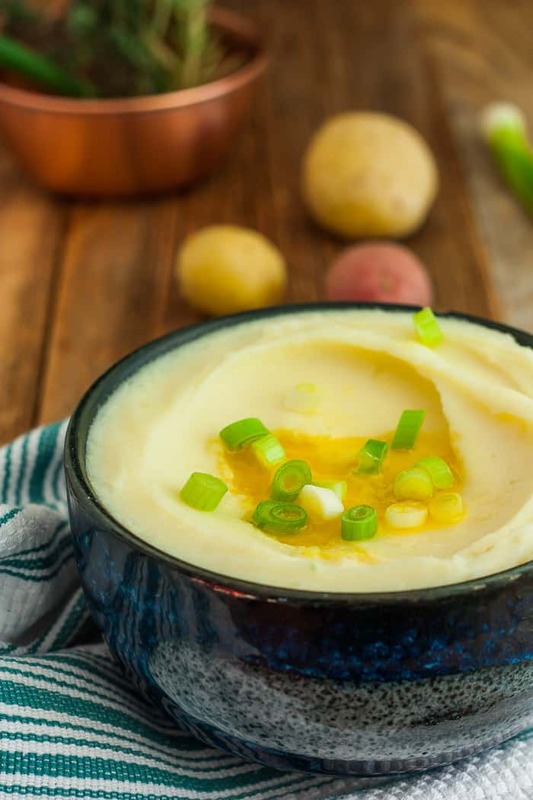 Creamy, fluffy, delicious, and with lots of zip, these Wasabi Mashed Potatoes take a class side dish to the next level. 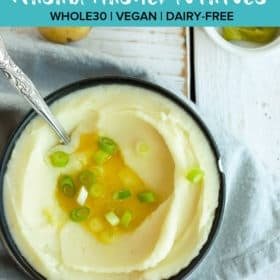 These comforting horseradish mashed potatoes are an amazing recipe that will be a new family favorite. There is a chance I have a thing for mashed potatoes. 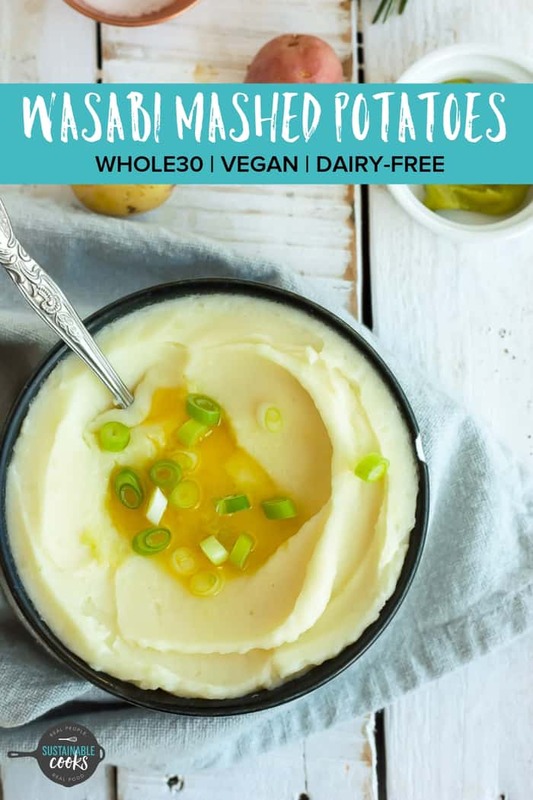 I mean, we don’t have them too often, but this wasabi mashed potatoes recipe marks my third mashed spuds recipe on the blog. You might remember Fluffy Mashed Potatoes in which I teach you how to make mashed potatoes with a ricer and how to prep them ahead of time. Or my Instant Pot Whole30 Mashed Potatoes where we discover all the secrets to not only make mashed potatoes in the Instant Pot but how to make them sooooo good even without all the dairy of a traditional recipe. 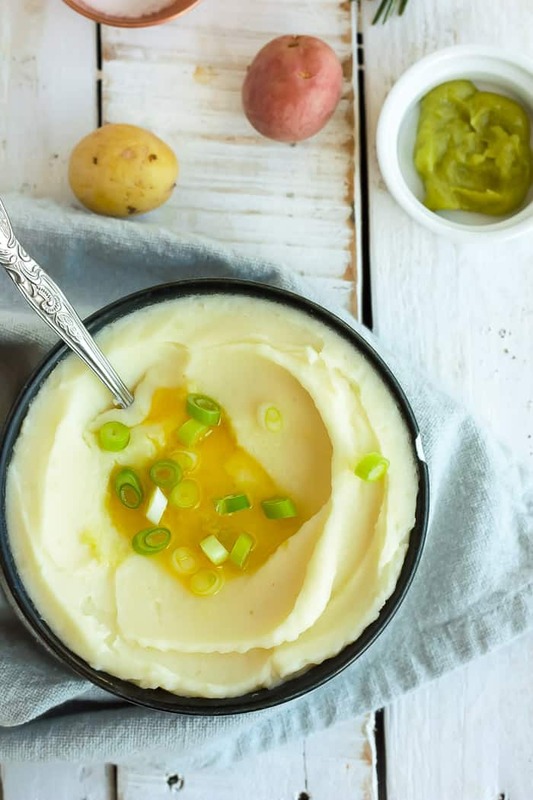 If those two recipes had a baby, and that baby was a little spicy and tasted delicious, it would be these Wasabi Mashed Potatoes. Disclosure: no babies were harmed in the making of these taters. If you find yourself in the rare position of having leftover mashed potatoes, consider making Simple Shepherd’s Pie With Turkey. Or, just eat them on the floor of your closet hiding from your kids. You got choices, that’s what I am saying. What Ingredients are in Wasabi Mashed Potatoes? Wasabi is a Japanese plant with a green root that is ground up to make an amazing paste or powder. It is very similar to horseradish in taste, so if you’re unable to find it locally, feel free to sub in equal amounts of horseradish. And then called them horseradish mashed potatoes and impress your friends! If your heart is set on using wasabi but you can only find wasabi powder, that will work too. You’ll want to premix it according to the directions on the package. For best results, use cold water and let it sit for five minutes before adding to the mashed potatoes. Here is the truth friends, you should be using a mixture of different kinds of potatoes. Starchy, waxy, and baking spuds all add their own perfect quality to this delectable side dish. I usually use a mix of russets, golds, and yellow. I prefer to peel mine, but if you’re a peels-in kind of person, you do you! Yes! Just have to make sure you keep butter, cream, and milk out of there to keep them compliant. 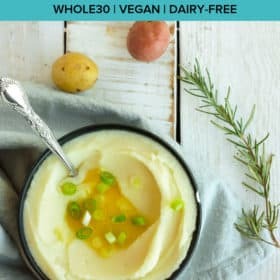 This recipe uses ghee (Whole30 approved) and Nut Pods (also Whole30 approved). You can use olive oil or vegan butter if you prefer. 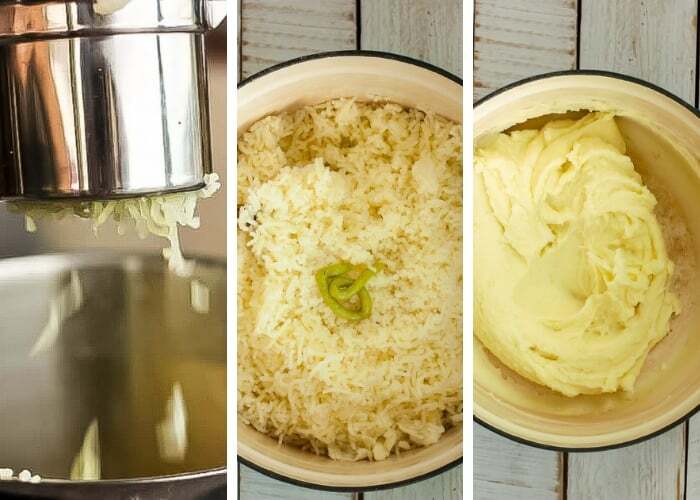 This horseradish mashed potatoes recipe uses a ricer which kind of looks like an enormous garlic press. It is the best-kept secret for making amazingly creamy and lump-free mashed potatoes. 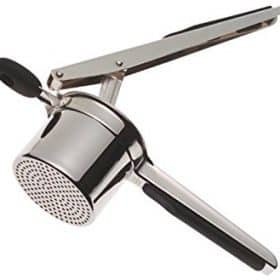 If you are a weirdo who likes lumpy taters (like most of the people in my family), feel free to use a hand masher. If you prefer using a hand mixer, mix very lightly. Over-activating the starches in mashed potatoes is why many people get “gluey” mashed potatoes. Place peel and cut potatoes in a stockpot full of COLD water. Cook until the tip of a knife can easily pierce through a potato. Drain the potatoes and add the ghee (or olive oil) and Nut Pods (or milk of choice) to the pan. Heat it on low until the ghee has melted. Pro tip: always heat anything you’re adding to your spuds that used to be cold (milk, butter, cream, etc.) as it prevents the potatoes from seizing up and getting too starchy. 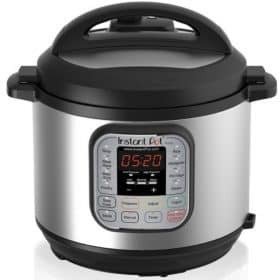 Fill your ricer halfway with potatoes, insert the pressing disc, and gently press the handles over the pot to create potato “rice”. Repeat until all potatoes have been pressed. Add the wasabi paste to the pot. Use a large spatula and fold all the ingredients together until incorporated. If your potatoes seem a little dry, feel free to add a bit more (heated) ghee or milk, or even some broth until they have reached your desired consistency. 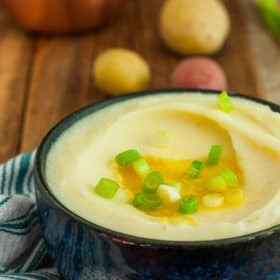 Can you make wasabi mashed potatoes in the Instant Pot? 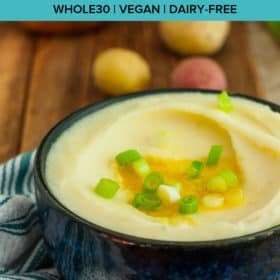 Yes, follow the directions as outlined in my Instant Pot Whole30 Mashed Potatoes. If you’re unable to find Nut Pods locally, Amazon carries them. 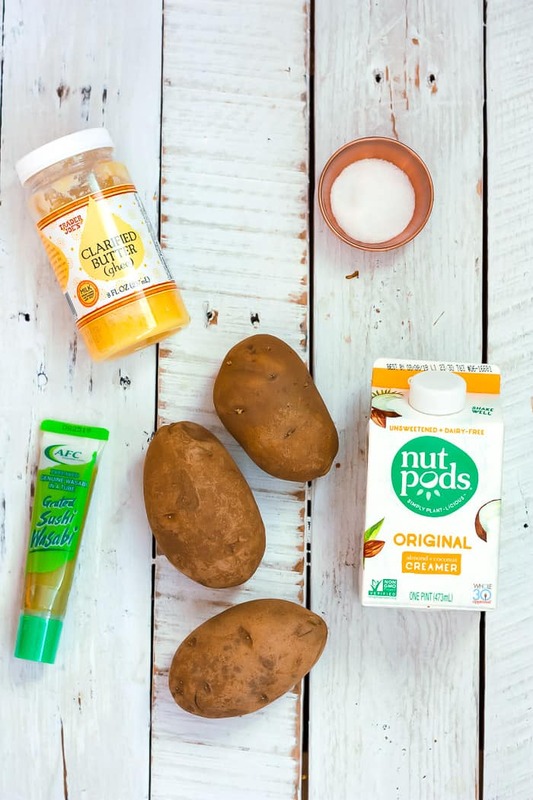 You can also use a substitution of half coconut cream and half almond milk in place of the Nut Pods. Start with 1 tsp of wasabi paste and taste before adding any more. Since I have kiddos, I like to mix up the mashed potatoes and set some aside for them before adding the wasabi. Feel free to add in garlic while the potatoes are cooking to take this dish to the next level. If you consume dairy, adding 1/2 cup of shredded Parmesan cheese would be ammmmmmazing! Creamy, fluffy, delicious, and with lots of zip, these Wasabi Mashed Potatoes take a class side dish to the next level. Peel and rinse your potatoes. Cut into 1-inch pieces. Place potatoes in a stockpot full of COLD water. Bring to a boil and boil for 2 minutes. Reduce the temp to medium and cook until the tip of a knife can easily pierce through a potato (about 8-12 more minutes). Drain the potatoes and add the ghee (or olive oil) and Nut Pods (or milk of choice) to the pan. Heat it on low until the ghee has melted. Pro tip: always heat anything you're adding to your spuds that used to be cold (milk, butter, cream, etc.) as it prevents the potatoes from seizing up and getting too starchy. 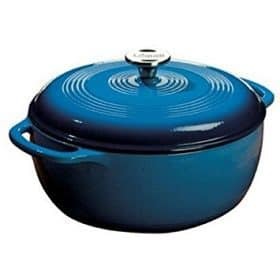 Fill your ricer halfway with potatoes, insert the pressing disc, and gently press the handles over the pot to create potato "rice". Repeat until all potatoes have been pressed. Add the wasabi paste to the pot. Use a large spatula and fold all the ingredients together until incorporated. If your potatoes seem a little dry, feel free to add a bit more (heated) ghee or milk, or even some broth until they have reached your desired consistency. Start with 1 tsp of wasabi paste and taste before adding any more.